Come experience one of our biggest local assets with Gretchen: our local rivers and lakes! Last year Gretchen won a prize for Best Swimmer, although they called it Solo Female Kayak Winner. This year you can float leisurely, or you can race to the finish. 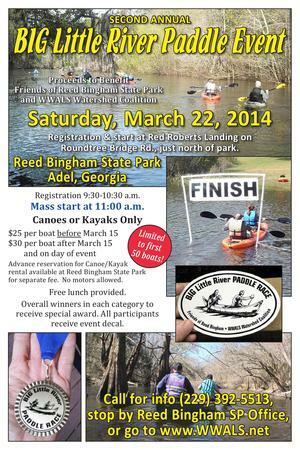 9:30AM to 1:00PM Saturday March 22, 2014 at Reed Bingham State Park between Adel and Moultrie on the Little River, it’s the Second annual BIG Little River Paddle Event, a fundraiser for nonprofits Friends of Reed Bingham State Park and WWALS Watershed Coalition. Registration (online or mail in the form, or at the event) is $25 per boat until March 15th, and $30 after that. This is a scenic three mile flatwater paddle on the Little River from Red Roberts landing (at Rountree Bridge, 31 11 32.05 N 83 31 13.25 W) in the north end of the park, to the boat ramp on the Colquitt Co. side of the park lake (park map). 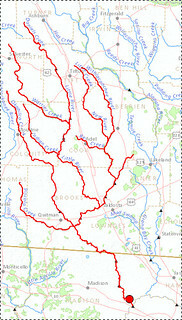 This entry was posted in Uncategorized and tagged Adel, Floridan Aquifer, Friends of Reed Bingham State Park, Georgia, Gretchen Quarterman, Gretchen Quarterman for Lowndes County Commission, gretchenforlowndes, Hahira, Little River, Lowndes County, Moultrie, Reed Bingham State Park, stewardship, Valdosta, Water, Withlacoochee River, Withlacoochee Wastewater Treatment Plant, WWALS, WWALS Watershed Coalition, WWTP on March 13, 2014 by John S. Quarterman. 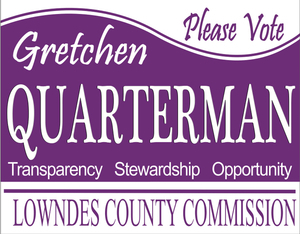 Hahira, 12 March 2014 — Gretchen Quarterman has qualifed for Lowndes County Commission District 5, for opportunity, stewardship, and transparency. Quarterman says local government needs to remember its purpose is to provide services for its people, unlike a business, which is for profit. “I will never suggest charging for a library card,” she said. 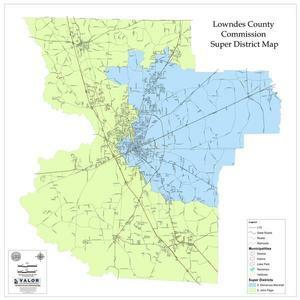 This entry was posted in PR and tagged Barretts, Clyattville, Dasher, District 5, Georgia, Gretchen Quarterman, Gretchen Quarterman for Lowndes County Commission, gretchenforlowndes, Hahira, Lake Park, Lowndes County, Lowndes County Commission, Mineola, Moody AFB, opportunity, PR, Remerton, Shiloh, stewardship, transparency, Valdosta on March 12, 2014 by John S. Quarterman.